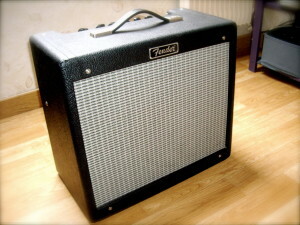 The Fender Blues Junior is a great little amp and goes a long way to getting those lovely Fender tones. Out of the box they are most of the way there and sound pretty good. But some do suffer from a few issues including hum/buzzing and elevated voltages. Also, the tone is slightly generic but can easily be opened out to give it an more vintage feel and really make it sing. Therefore we can offer a multitude of modifications to help with the above. This is the most noticeable issue because you actually hear it. There are of course many reasons that a valve amplifier can buzz but the Blues Jr seems to have two common issues. The first is that the ac heater supply rails seem to induce buzzing within the preamp valves and the second relates to the location of mains and output transformers. We are able to significantly reduce buzz by converting the heater power supplies to DC and moving the output transformer. Because every amplifier is different, we tailor these mods to the amp in order to achieve the lowest possible buzzing. Perhaps the most detrimental, but least noticeable (short term) problem within some Blues Junior amps is the very high bias which not only reduces the life of your valves, but also adds to the buzzing problem above. This can be solved simply by swapping out one resistor or by putting a variable bias pot inside the unit in order to adjust it. A simple mod, but quite crucial to keeping your amp working for a long time. We can offer a few other mods to generally improve the tone of the amp by changing a handful of components. Our favourite tone is that of the Silverface amplifiers but we can pretty much modify them to whatever suits your preference. Wherever possible we’ll retain the integrity of the look of the amp. All the above modifications are installed without being seen and that’s how we like to keep it.